I’ve never really had a green thumb. Actually, my thumb could be nicknamed the “Thumb of death”. Every plant I get I kill. There’s just too much to know. How much light? How much water? I’m not home enough to care. As I type this, I have a decaying plant on my dining room table. It’s been whispering “help meeeee” for months now. I pass by it every time I walk to the bathroom. I see it and do nothing. My mom had kept it alive for me for years. When I got my own place she decided it was time I took it home. I wasn’t sure how long it would last under my care. It’s been 3 years, and its asking me to let it die. Anything I know about plants, or gardening, I’ve learned from my dad. I’m not a completely useless student. He points out the plants and tells me to pluck everything else. Easy peasy. Recently, an older lady I know asked for some help weeding one of her flower beds. I like working in the garden, so I gladly accepted her invite knowing every time I help her I get a free dinner out of the deal. A free dinner is always worth it. I get to her house and she brings me to where the overgrown flower bed is and explains this is where I will be working. She points out a few flowers that should be left alone, but the rest could be torn up. To confirm my orders, I repeat back what she said to me pointing at the plants to save. She says I’ve got it. Then, she leaves. Instantly, its as if my brain has been completely flushed of the previous conversation and everything looks like a plant that should be saved. Or is it a weed?! As I work, I begin to pray. “Hey, God. Can you help me not mess up this ladies garden?” Then, I continue on with other non-weed related prayers. My heart had been heavy that day with some news concerning a friend. She was struggling with some very serious stuff and I felt like I had run out of wisdom and encouragement. I’d said it all. I knew she needed a word from God– not just some words from Holly. As I prayed, God began to reveal some things to my heart through the weeds. Ya, you heard me right. I know I’ve said this before, but I think it bears repeating. I’m a simple kid, and God speaks to me in simple terms. Sometimes its through a song, a conversation with a friend, or in this case through an evening of gardening. Very often, we get caught up looking for a voice in the clouds or a wild burning bush. I’ve never had those experiences, but I do know God speaks to me and it isn’t something I’ve made up. How do I know that? Cause His thoughts are not my thoughts– He points out things I would have never come to on my own. That’s how I know. Lesson #1: I need people in my life who will point out the weeds in my life. I don’t always recognize them and sometimes things may look like flowers to me, but in actuality are weeds. When I was a kid, like most kids it seems, I would pick dandelions and make little bouquets. I had believed they were flowers until one day someone told me, “Hey. You know those things are weeds?” I needed someone wiser than me to point that out. We’ve got things in our lives– be it lies we believe, things we are doing, a direction we are heading– that we need people wiser than ourselves to point out and say, “Hey. That’s a weed.” I’m thankful for the people who have done that for me knowing I would have done/believed some pretty dumb things if it hadn’t been for those people caring enough to lovingly point out something in my life that needed to be removed. Lesson #2: You’ve got to remove the roots of the weed, or they’ll come back. Weeds are persistent boogers. Sometimes you’ll think you’ve gotten all the roots only to find a weed in the same exact place a few days later. God is the one who needs to remove the “weed”. He sees the depths of the root and He knows the best way to get rid of it. I’ll miss something if I try to do it on my own strength. Here’s an example of some weeding I’m asking God to do in my life. As far back as I can remember, I’ve always had a poor self-esteem. Poor is putting it kindly and as I’ve mentioned in previous posts, I’m downright abusive to myself. I’ve repeated derogatory names taking them on as my identity. Now most people would say– “Speak positive, Holly!” That’s part of it, but unless God comes in and gives me His vision, and His thoughts, then this weed is just gonna linger because I’ll only be dealing with the surface issue (negative talk) when there’s a deeper heart issue that needs weeding and healing. 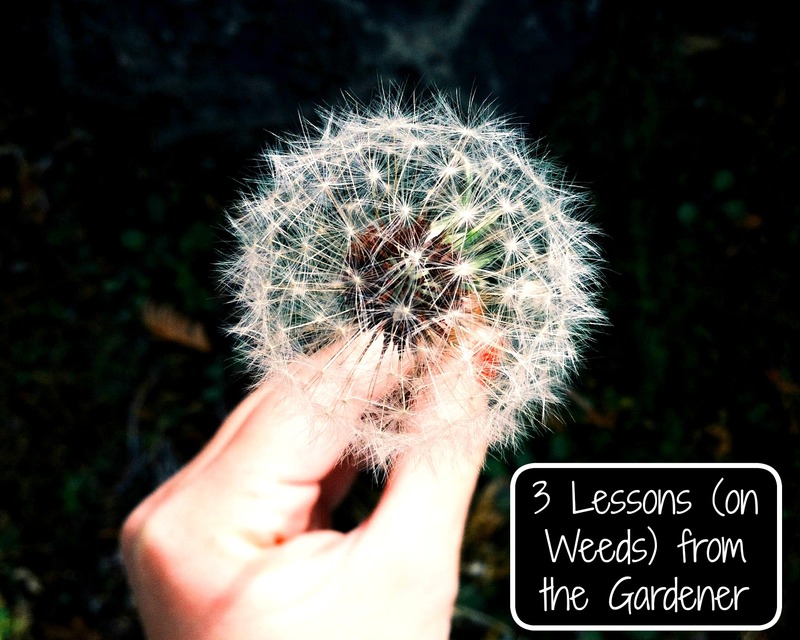 Lesson #3: Weeds come out easier in fertile ground. If your ground is dry, weeding is much more difficult. You are more apt to struggle, toil and sweat. How does one keep fertile lives? Read the Bible. Worship. Pray. Ask godly people to speak into your life. Be obedient to what God is speaking to you. All of those things water our souls and keep the ground workable. It’s easy to let life harden us– to allow people’s words, disappointments and crisis’ to deplete us of Living Water. That’s why it’s so important that we pursue God (through the above mentioned means…as well as many other ways) in order to stay flexible. This is my advice to you, allow the Gardener to come in and do some weeding. Allow Him to point out things that need some work and trust Him in the process. Know that anything being removed, is being removed for your good. Sure, it’s not a pain-less process, but in the end you’ll have a beautiful garden full of flowers instead of an overgrown and unkempt plot full of weeds. Thanks Holly for the post. I’m a lot like you. I used to be able to have good plants and then I went through a bad period and now I can’t keep one to save my life. The comparison to our life in Christ is a good one. May I use your post in my church newsletter? Thanks so much for the comment. There are a lot of us plant killers out there, aren’t there? 🙂 Feel free to use my post in the newsletter– I would just request that I would get credit as author and no changes me made. Thank you! More good stuff, as always. The new house is a landscaper’s dream, and I’ve been intimidated. But reading this, I feel a gentle nudge letting me know those flowers are a gift, and the time I’ll need to spend isn’t about weeding, but about receiving some amazing wisdom along the way. Such a thought-provoking post. This Friday, some of our students and myself will be working at a community garden and you’ve just helped me with my devotion for that time! Thank you so much! I’m actually going back out to the garden tonight– praying to hear His voice, again. 🙂 And glad I could help– may the students hearts be receptive to what God is speaking!